2. Combine the powdered sugar, almonds, and strawberries in a food processor and grind until a fine powder. Sift thoroughly through a fine mesh strainer and set aside. 5. Whisk the food coloring in to the egg whites. 6. Gently fold the sifted almond and powdered sugar mixture into the egg whites in three to four stages, just until the ingredients are incorporated and the batter slowly re-absorbs peaks. 7. Transfer the macaron mixture to the prepared piping bag and piping small rounds on to the lined baking sheets. Tap the baking sheets on the table a few times to release air pockets. 8. Rest the macarons for at least 30 minutes (and up to 60), until the outside shells are no longer tacky and sticky to a light touch. 9. Preheat oven to 290 degrees F, with the oven rack in the bottom third of the oven. 10. Bake the macarons in the oven, one sheet at a time, for 24-28 minutes total, rotating the sheet half-way through the baking time to insure even baking. 12. Once the macarons are cool, flip each over and lightly spritz the bottoms of the macarons with red wine using a mister. Fill with mascarpone cream filling (recipe below) and red wine gelees, if using. 13. Let the macarons "cure" in an airtight container in the refrigerator overnight before enjoying. *Note: the resting and oven temperature and times are adjusted to what works in my kitchen and oven (which, to my knowledge and according to two oven thermometers, is quite accurate). Please note that you may have to adjust according to what works in your kitchen and oven. For tutorials or suggestions, notsohumblepie has a few great articles about avoiding maca-wrongs. Tip: Sifting is key to achieving smooth macaron shells. Usually I'm quite lazy about sifting when it comes to most recipes, but I absolutely won't skip it when it comes to macarons. Tip: I find that macaron shells form more quickly when resting in an area with decent airflow, so I've taken to turning on my dining room's ceiling fan when resting the macaron shells there prior to baking. Tip: I bake my macarons with a pizza stone in the bottom-most rack of the oven, helping to insulate against direct heat and promoting even baking. for red wine gelees (optional), I used one fourth of the recipe available here, substituting red wine for both the fruit concentrate and the water and not coating the gelees with sugar at the end. 1. In a mixer, combine the cream, cheese, and sugar. Whisk on high until stiff peaks form. 2. Stir in the vanilla extract. 3. 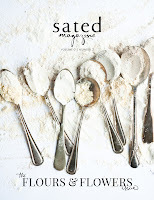 Use immediately to fill macarons. this is the perfect pick-me-up any time of the week in my opinion! 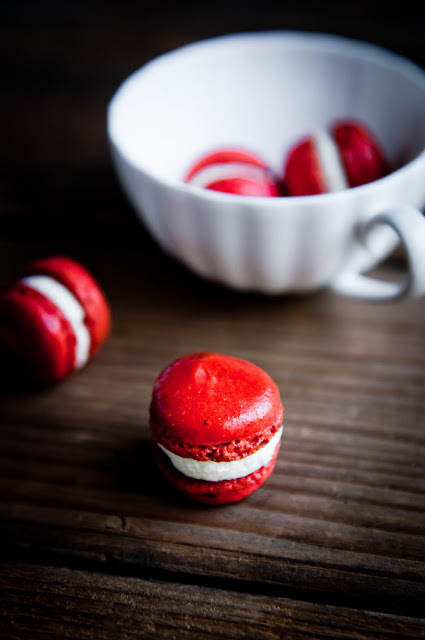 i have not experimented with wine and macarons yet (campari yes) but it's a great idea. feeling very inspired! 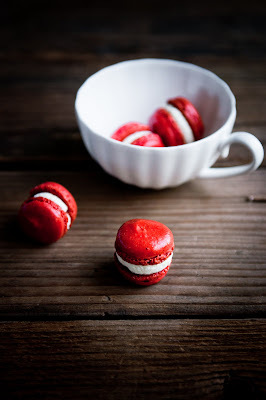 Gorgeous red color to your macarons. Luv the idea of using wine! No words to describe them, from the perfect shape and feet to the bright colour! Gorgeous! These are so perfect!!!! I love the mascarpone cream! I am blown by the gorgeous colors and the perfect shape!!! Lovely macarons! My mid-week pick-me-up is ice cream :D It makes me so happy to reach into the freezer after class and just dig in with a spoon. Oh my, thank you all so much! your macarons look so so good. i would love to try one. great, the combination of flavors. WOW! That RED just POPS out of the screen! Gorgeous! Your macarons turned out perfectly beautiful! these are incredible! really my mouth is hanging open. i love the sheen and the deep, rich hue you pulled off. i always thought macarons were notoriously difficult to make, but props to you for having them as a "mid-week pick-me-up"! Ah!! Love these littles so so much!! These are gorgeous! I haven't gotten into making macarons yet myself, unfortunately. Maybe you can give me some tips on getting started! I email you the info about tonight's dinner party. I hope you are still able to make it. Let me know if you don't get the email thought. My email is gabi dot logan at yahoo. These are so incredibly gorgeous. Mascarpone and cream is quite probably the most divine filling for a macarons too. Wow! Breathtaking and original! I so love the flavors! Adult macs if I ever saw them. Beautiful color, perfect shells and amazing flavors! 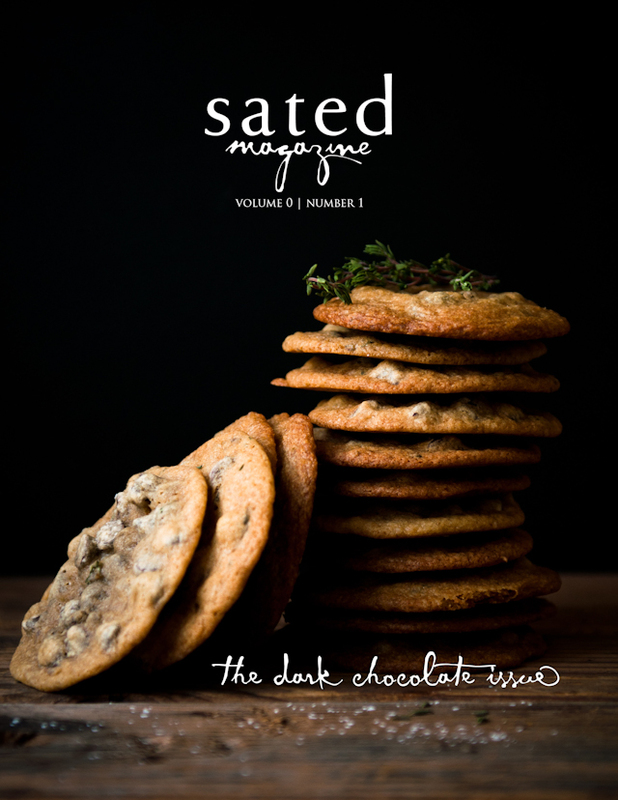 My pick-me-ups are much more homey and humble although I love whipping up a good batch of chocolate macarons with chocolate ganache! 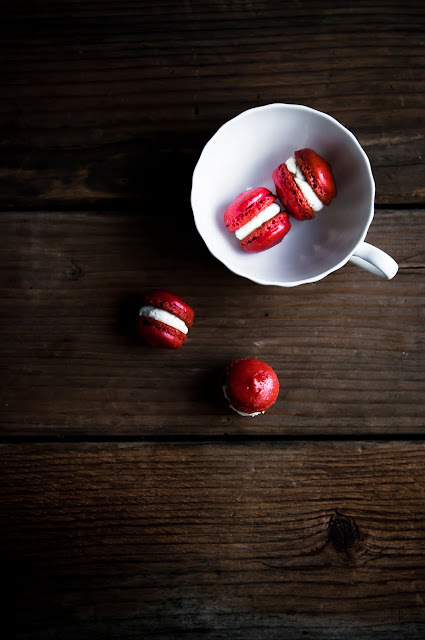 @squirrelbread (heather): macarons are actually pretty simple and quick, once you make them a few times and get the hang of it! @Jamie: mmm.... chocolate ganache with macarons... nom. hopefully soon i'll muster the courage! thanks. You already know I love these photos and the gloss of your little kisses 8) hehe. Fascinating flavors, too, Steph. You're an inspiration as usual! These too my breath away...the pictures and the flavour combinatiuon. All so alive and ready to 'go'! Just gorgeous! Honestly, I'm just simply not motivated to make these, but the photos are so stunning I couldn't help myself from saying so. They're gorgeous! Just awesome I would call it the red ruby! Now this is a macaron I could love. I quickly tired of the incessant search for feet...but if I thought that search might result in a bit of wine it might be worth another trip! @Barbara: your comment totally made me laugh!